Due to my extremely serious political phobia, I really know nothing about politics. 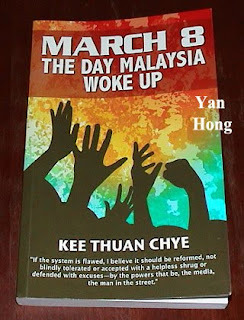 After reading "March 8 The Day Malaysia Woke Up", I only then understand what is the Malaysia March 8 political tsunami. "March 8 The Day Malaysia Woke Up" was published by Marshall Cavendish Editions. The editor is well-known journalist, poet and dramatist Kee Thuan Chye. It consists of two parts : (1) Change and (2) Hope. There are altogether more than 30 splendid articles in this book. I read "March 8 The Day Malaysia Woke Up" because reading is one of my hobbies. Nothing more than that. Hopefully, don't twist and murder my reading interest.